Patients with a loss of the cervical curve are shown to have less blood flow in the vertebral arteries in this study. Now, let me ask you doctor, if you have objectively shown that your patient has a kyphotic neck, do you release them from care knowing that it has a higher likelihood of other pathologies from occurring (all of this is available to you as a Premium Member of Professionally Integrated) including decreased blood flow to the brain?? In my opinion as a doctor you must do something about the pathology. 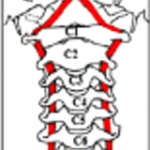 If you do a treatment that does NOT address the cervical curve, send them to someone who does. Do you educate your patient of the problem with this condition? Do they understand the importance both in the long and short term?? If not, let me help you! This study the authors measured the cervical lordosis based on the “Harrison method, posterior tangents”, so should you. Here is another study that uses measurements to identify a pathology. How many times will a insurance company say measurements are unnecessary? We know that is a lie and should not back down for giving exceptional care! The authors used Doppler ultrasound read by a “blind” radiologist and found the “loss of the cervical curve” decreased blood flow! Do you want a decreased blood flow to your brain or your patients brain?? The authors also state this “Abnormalities of this natural curvature, such as loss of cervical lordosis or cervical kyphosis, are associated with pain, disability, and poor health-related quality of life .” We know this! This is why we have to give our best to our patients and not how some insurance company wants us to treat, which is usually to ignore this pathology all together. These patients need treatment. Let me rephrase that, these patients need specific treatment that has been proven to improve the cervical curve. Not all chiropractic techniques can or will do this. CBP has been the one to demonstrate that it can.